Mark's Tickets is the best place to find tickets for Cleveland Browns fans. Just check this page for any new events or schedule updates throughout the year. We sell tickets to every Cleveland Browns game around the world. 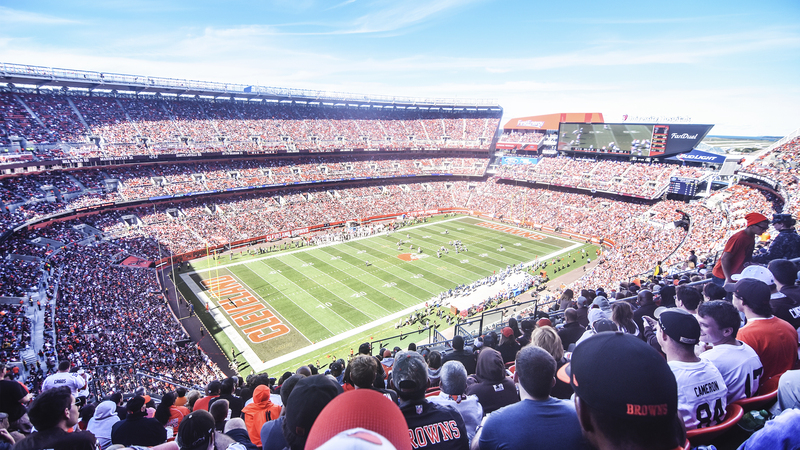 We know how passionate Cleveland Browns fans can be about football, so we make sure to have hundreds of tickets for every game available right up until it starts. For those looking for cheap Cleveland Browns tickets, we offer tickets starting at very low prices (many times below face value). We offer tickets in most sections of every venue that you can see Cleveland Browns. Simply choose the city or venue that you are interested in below, and you will be able to see all of the available seats. Do not forget that Marks Tickets also specializes in sold out Cleveland Browns tickets. No longer will sold out shows prevent you from seeing Cleveland Browns. The Cleveland Browns are a professional football team that plays in the NFL. The Browns play their home games at FirstEnergy Stadium in Cleveland, Ohio. With 16 games per year, and 8 being home games, The Cleveland Browns are a professional American football franchise based in Cleveland, Ohio. They are currently members of the North Division of the American Football Conference (AFC) of the National Football League (NFL). Their current home field is FirstEnergy Stadium (called Cleveland Browns Stadium from its opening in 1999 to 2012). Their administrative offices and training facilities are located in Berea, Ohio. The Browns' official colors are burnt orange, seal brown, and white. They are unique among the 32 member franchises of the National Football League in that they do not have a helmet logo. The Cleveland Browns were founded in 1945 by businessman Arthur B. “Mickey” McBride as a charter member of the All-America Football Conference (AAFC), which began play the following year. Originally intended to be called the Panthers, they were instead named for their first head coach, Ohio coaching legend Paul Brown, but businessman General C. X. Zimmerman, who owned a Cleveland Panthers team which was a member of the first American Football League in 1926, asserted his rights to the name. The Cleveland Browns dominated the AAFC, compiling a 47-4-3 record in the league's four active seasons and won its championship in each of them. Following the 1949 season, the AAFC folded, and the Browns were one of three franchises which joined the National Football League (the others were the San Francisco 49ers and the original Baltimore Colts). The Browns won a championship in their inaugural NFL season, as well as in the 1954, 1955, and 1964 seasons. From 1965 to 1995, they made the playoffs 14 times, but to date, have never won another championship and have never appeared in a Super Bowl. On November 6, 1995, Art Modell, who had purchased the Browns in 1961, and signed a 25-year agreement to lease Cleveland Municipal Stadium from the city in 1973, announced he was relocating the franchise to Baltimore, Maryland following the season. It was perceived as mirroring the Baltimore Colts' controversial relocation to Indianapolis, Indiana twelve years earlier. Modell claimed he was in debt and was denied a new stadium to replace 64-year-old Municipal Stadium. However, shortly after Modell's death at age 87 on September 6, 2012, it was revealed that he actually was offered a new stadium long before he made the decision to relocate. The reaction to his announcement was immediate and profound. Numerous lawsuits, notably a breach of contract suit alleging he had violated the terms of his lease, were filed in an attempt to halt the relocation. Ultimately, an unprecedented compromise was reached whereby Modell was allowed to relocate the Cleveland Browns, but he relinquished rights to the Browns' intellectual property and history; they were kept in trust for a future Browns expansion team. The Browns' operations were suspended for three seasons. In the interim, Cleveland Municipal Stadium was demolished and Cleveland Browns Stadium (now FirstEnergy Stadium) was built on the site. The late Al Lerner, a former friend and former business partner of Art Modell's, was approved as owner. Modell's franchise was named the Baltimore Ravens. Since resuming operations in 1999, the Cleveland Browns have had very limited success, compiling a 73-151 record through the 2012 season. They have had two winning seasons — a 9-7 record in 2002 and a 10-6 record in 2007 — and qualified for the playoffs in the former as a wild card team. They have had seven head coaches in that time. Their current head coach is Rob Chudzinski, who is entering his first year.